This is yui from Tokyo. It's calm weather these few days and autumn is already here in Tokyo. Jaa reported that Bangkok has lots of rainy days, but here in Tokyo we enjoy nice sunny days. However, at the change of seasons, weather is unsettled, so you should be careful not to get cold! By the way, what do you imagine, hearing the word "autumn"? In Japanese, there's a word "Minori no Aki" means "autumn, the season of harvest." So this means that we have many festivals to celebrate the harvest and thank gods for it. Of course, there is also many festivals with various purposes in autumn in Japan. 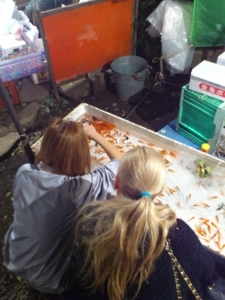 Today, I'll show you a bit of the festival in Tokyo last weekend! I happened on "Reitaisai" of Yoyogi-hachiman-gu. 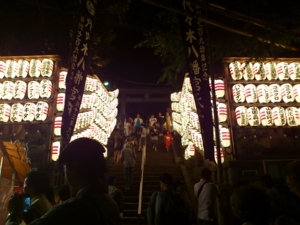 Reitaisai means the annual big festival celebrating the important day (ex. the date of constraction) of the shrine. Yoyogi-hachiman-gu celebrates Oujin-Tennou (the emperor "Oujin"). If you want to know much more, you can contact to HP of the shrine! Reitaisai at Yoyogi-hachiman-gu is quite big with various stalls, Omikoshi(communal trip by the portable shrine), Kagura(Shinto music and dance numbers). 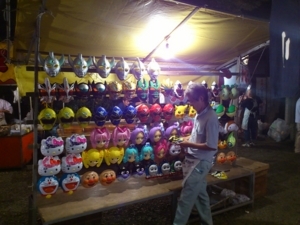 Unfortunately I couldn't watch Omikoshi nor Kagura, but could take some photos of stalls. These are the stalls at the very entrance of the shrine. The shrine itself is far back from here (you have to go up stares and walk for a while, yes the shrine is big!). 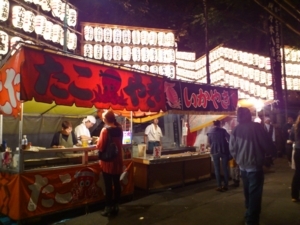 The stall on the left sells Takoyaki(baked octopus ball), and the right one sells Ikayaki(grilled squid), both are very popular menu in Japanese festivals. Names of people and company dedicate to the shrine are wrote on Chouchin (paper lantern). Entering the shrine, you can find so many stalls. 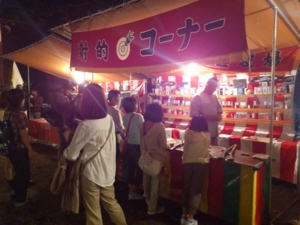 There is a variety of stalls from the one selling food like Wataame (cotton candy) or Yakisoba (noodles) to the one entertaining with lottery, shooting games and cathing balls. 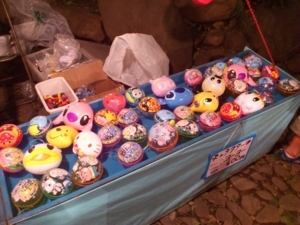 A stall of cathing character-shaped yo-yo. Characters from Disney, Sanrio, and varioius anime! These are also inspired by characters. We have this kind of masks from the ages before. Take close aim at the prize! 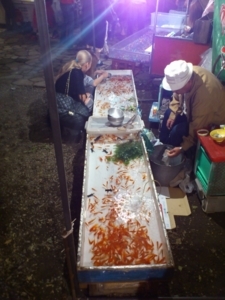 A stall for catching goldfish. THIS IS the festival in Japan! These kinds of stalls introduced above exists when I was small, so I was kind of admired how these stalls have been keeping their styles and how people can appriciate the same things for a long time. The shrine was very crowded with children. Also it was crowded with adults enjoying festivals. Everyone seems to like festivals at any time, at any place. How is the festival in your community like? ?